WHEN JESUS ANDhis disciples returned from the country of the Gadarenes they saw a crowd standing on the shore eager to welcome them back to Capernaum. And again Jesus taught them and healed the sick folk they brought to him. Presently a man came running to Jesus, looking very much distressed. He fell down at Jesus’ feet and cried, “My little daughter is lying at home ready to die; but if you will come with me and touch her, I know she shall be made well.” This man was a ruler of the synagog in Capernaum, and his name was Jairus. No doubt Jesus knew this man, for often he had taught in the synagog. Now he started at once to go with Jairus to heal his daughter. The disciples, too, went with him. And the crowd followed, eager to see another miracle. As they went, the people pressed close to Jesus; for every one was eager to walk as near to him as possible. In this throng was one poor woman who had been ill for twelve years. She had spent all her money in taking treatments from doctors, yet they did not cure her. Now she had no more money and still she was greatly afflicted. But she had heard of Jesus’ power to heal, and this glad news brought courage to her sad heart. She decided to go to him and be made well. So she edged her way closer, until she could reach out her hand and touch Jesus’ clothes. Immediately she felt the healing power go through her body, and she stepped backward into the crowd. The disciples were amazed at this question. “Why do you ask who touched you, when the people are pressing against you from every side?” they inquired. But Jesus answered, “Some one has touched me, for I felt healing virtue go from my body. Jairus stood by waiting impatiently for Jesus to start again. He was fearful that his little daughter might die before they could reach her bedside. 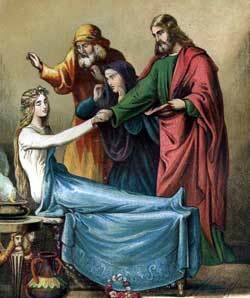 And surely enough, a servant from his house came to meet them with the sad news that the little girl was dead. “Do not trouble the Master any longer, for it is too late,” he said. Jesus heard the message, and he saw the deep grief of Jairus. He said to the father, “Do not be afraid; only believe, and she shall yet be made well.” So they journeyed on. At the ruler’s home many friends and neighbors had gathered to weep and to comfort the sorrowing mother. Jesus told them to cease their weeping, for the child was not dead, but sleeping. They did not understand that Jesus meant to say, “Death is only a sleep from which we shall all waken again.” And they scoffed at his words; for they knew the little girl had no life remaining in her body. Then Jesus sent every one out of the room except the father and mother of the little girl and three of his disciples. Simon Peter, and James, and John were the three whom he permitted to remain with him. At his command she opened her eyes and rose up to walk about the room. Jesus told her parents to give her some food to eat, and he asked them to tell no one what he had done; for already the people were thronging him, and news of this miracle would draw greater crowds than ever. So he touched their eyes and said, “Let it be done to you just as you believe.” And their eyes were opened so that they could see. Jesus asked these men to tell no one what he had done; but they went everywhere telling how Jesus had opened their blinded eyes. But the fault-finding Pharisees said, “He does not cast out evil spirits by the power of God, but by the power of Satan.” They were jealous of the fame that had come to Jesus, and they spoke evil of him. So great were the crowds who pressed to hear Jesus that he saw he could not teach them all. Then he sent his twelve disciples to preach in other cities, and he gave them power to heal the sick and to cast out evil spirits, and even to raise the dead. The work was too great for him to do alone, and he had chosen these men to help him. So they went to other towns and villages, preaching the gospel and healing the sick, just as Jesus had commanded them to do.